Born Ferdinand de Bulhoes in Lisbon, Portugal, Anthony was the son of a knight in King Alphonso’s court. He began his studies at the cathedral in Lisbon and joined the Augustinians when he was fifteen. Ordained in about 1219, Anthony transferred to the Franciscans in 1221 at which time he took the name Anthony. Sent to Morocco to preach to the Moors, Anthony was soon forced to return because of illness. He was stationed at a small hermitage in Italy, where he spent his time studying Scripture, praying, and doing menial tasks. Once, at an ordination when no one was prepared to speak, Father Anthony hesitantly accepted the task. His fellow Franciscans, expecting little from Anthony, were astounded by his sermon and Anthony began a new ministry as a preacher. Anthony was assigned to preach throughout Italy. Noted for his eloquence, fire, and persuasiveness, he attracted large crowds wherever he spoke and was particularly successful at converting heretics. 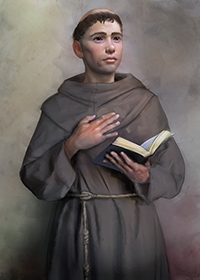 Recognized as a great scholar, Anthony became the first Franciscan friar to teach theology to other Franciscan friars. Appointed minister provincial of the Franciscan order, Anthony, was released from these duties in 1226 in order to resume his preaching. He settled in Padua in that year and his bold and brilliant preaching completely reformed the city. He worked to abolish debtors’ prisons, helped the poor, and worked ceaselessly and untiringly with heretics. All of this took its toll on Anthony’s health and he died on June 13 at the age of 36. Anthony is also widely invoked for the return of lost articles. This belief comes from a story which told of a novice who ran away, taking with him a book of Psalms which Anthony had been using. Anthony prayed for the return of the book and the novice, struck by an alarming vision, brought the Psalter back to Anthony. Saint Anthony is the patron of many things and places besides lost articles. Among them are American Indians, expectant mothers, and sailors. His memorial is celebrated on June 13. Anthony's message today: Anthony has been a favorite saint for hundreds of years because of the belief that he intercedes with God on behalf of many who have lost articles. Any Catholic who has, say, misplaced the car keys and said a short prayer to Saint Anthony can tell you how they “miraculously” found their keys virtually “under their noses.” We can count on the saints to help us, knowing that they, too, experienced many of the difficulties we encounter in our own lives. Is there a special need that you have at this time which may be helped by the intercession of a saint?